Why can’t every outing be like this! Compared to the biblical conditions we had for the regatta yesterday(! ), today’s water was beautiful, so still, and the river was deadly quiet – that combined with the sun was beaming down on us made for an amazing outing! Due to the last-minute unavailability of coxes this morning, there were changes to the plans for outings, to make do with the people available. 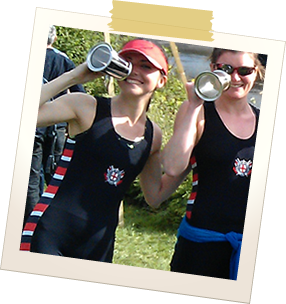 As a result, I went sent out in a coxless four with Laura P (stroke), Bethan (2) and Marketa (Bow/Steerer) – with Ted coaching us from the launch. It was a very technical session, as the balance in a 4 is over exaggerated due to the lack of extra bodies and blades to stabilise the boat, and so the drills Ted gave us were done in pairs. This meant we got much more personal coaching than as normally happens in outings in 8s. We went through drills for getting catches in together, and before driving through. For this we did the exercise where we row with our outside hand only, and have the other hand on the back of the wheels of the seat. This helps to check when force is being applied to the blade. If the wheels move before the blade is in the water, then were missing water at the catch – and so reducing the stroke length. As we are repeatedly told by the coaches – in summer sprint racing, every inch matters and can make a huge difference – therefore it is vital to get the blade in the water before applying force with the legs – and to do this at the very front of the catch. Another drill was rowing with pausing at various parts of the stroke, building up to arms away, this time as a four. The balance at first was a little patchy, however we soon overcame this, and Ted then let us row as a four back to the club. As we got into the rhythm of it, it was really coming together, and Ted was as his usual self – getting very excited in his launch screaming and cheering us as we got a good run going on the boat. There were four or five strokes in particular whilst rowing between the boats back to the clubhouse that were near perfect – the boat perfectly balanced moving smoothly through the water! We all got out feeling rather pleased with ourselves, with big grins on our faces! Fingers crossed it’s not the only time we get out in a four – as a crew I think we were working together really well, and given more practice we could make a good crew for racing! Outings like that remind us all why we put in the hard work and effort over the cold winter months! After the morning fours outing, some more coxes arrived and so it was back to the usual 8s. Not as exciting as the first outing but still a good one, and some valuable lessons learned. All in all, a good day on the Tideway! Now home for a mid-afternoon Sunday nap – I’ve still not caught up from camp!